You prefer musing about life’s flashback or finding happiness observing the scenery as compared to your friends blasting their lungs out singing songs on a road trip. Reading a book in a quiet corner of your house seems more enticing than cheering over a Knicks game with your besties. A quiet dinner date is more soulful than dining out in a pub. At work your forte is email communication as compared to impromptu and long board meetings which leave you feeling drained of mental energy. Office gossip in the cafeteria seems forced and waste of time for you. Sounds familiar? In that case you belong to the growing fraternity of introverts. Before we dwell into their strengths and what they bring to the business world, let us do a psychological analysis of an introvert’s mind. In the 1920s the Swiss psychiatrist Carl Jung in his book Psychological Types introduced the terms ‘introvert’ and ‘extrovert’, two mutually-exclusive attitudes that seem to appear randomly. What appears to be random behavior is actually the result of differences in the way people prefer to use their mental capacities. This theory served as the foundation for many tests used to measure personality including the popular Myers-Briggs Type Indicator and the Big Five personality traits. However, in late 1960s German psychologist Hans Eysenck conceived a different theory in his book The Biological Basis of Personality. 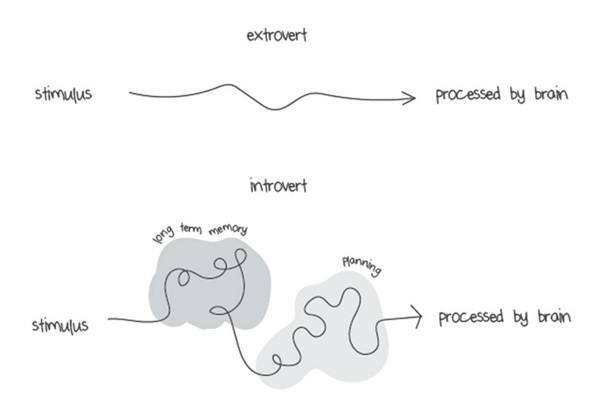 According to Eysenck’s theory, the behavior of introverts and extroverts happens due to differences in cortical arousal (the speed and amount of the brain’s activity). The theory noted that, compared to extroverts, introverts have a naturally high cortical arousal, and may process a heavier amount of information per second. This explains why introverts tend to avoid noisy or crowded environment as their brain will be quickly overloaded causing them to shut down to prevent the influx of information. Whereas extroverts in this same active environment are minimally aroused and seek for more stimulating environment to augment their cortical arousal. Latest research has shown that no two introverts are the same and an article published in the NYMag proposed four different types of introversion: social, thinking, anxious, and restrained. This means that introversion is not the exact opposite of extroversion and in spite of the fact that both of them should not be viewed from an antagonistic perspective, the tug of war between them still exists. Each type misjudges the other and tends to notice the negative aspects of the other and whether we like it or not extroverts have always dominated the classroom, workspace and landscape of corporations. For a long time, introverts have been stigmatized and introversion is considered as a behavioral defect whereas extraversion is still associated with charisma and strong leadership qualities. The most popular and eye candy high-school jocks are the ones who play popular sports which involve collaboration like soccer, basketball, rugby etc. How many girls have a crush on a boy who prefers to play chess or write poetry in solitude? So, before we figure out whether extroverts can prove to be better leaders than introverts let us analyze the rise of extroversion as a cultural movement. Before the twentieth century, western societies equated the ideal person to be thoughtful, disciplined and modest. First impression was not important, but the person’s inner values and behavior mattered the most. As author Susain Cain, in her TED talk clearly mentions that the culture of character was the emphasis and that is why we had sayings like “Character, the Grandest Thing in the World’’ and icons like Abraham Lincoln who were not pretentious and modest were venerated as role models. Enter the era of industrial rise in America we witnessed the little houses on the vast farmlands of agricultural America transform into business hubs. With rapid urbanization, people started migrating to cities and to establish themselves in the uncertain scenario they had to prove themselves in a crowd of strangers by exhibiting traits like magnetism and charisma. Sayings like ‘Make noise and be heard’ became popular. Even the self-help books and best sellers during that time were changed to meet the needs of the rising aspirations of American corporate culture. Dale Carnegie with his humble background as a poor farmer’s son wrote his bestselling book ‘How to Win Friends and Influence People’ to educate other businessmen including the self-proclaimed richest introvert Warren Buffet who wanted to communicate better with people. Even though many modernist writers tried to epitomize the banality of eventlessness and the quiet folds of the everyday, Hollywood could not venerate the era of solitary reaper and produced films in concordance with pop culture. To conclude with the advent of industrial era the man of action was preferred more than the man of contemplation. Introverts are everywhere. In fact, everyone or two out of three person that we know happens to be introverts and the best part is 75% of people with an IQ over 160 are introverted with their introversion increasing with intelligence. So, what are their strengths that they can bring to corporations and life in general apart from their intelligence? Introverts are characterized by an inward flow of personal energy. They are happy alone with rich imagination and prefer reflection over action. This might explain why in board meetings they take time to open their mouth because they believe in thinking a well-planned idea before speaking it or bragging about it in contrast to extroverts who will interrupt you because they run out of patience to keep waiting for their turn to speak. Don’t corporations require a well thought of idea as compared to that where little reflection was exhibited? After all Elon Musk was inspired to start his own company because according to him, he was too nervous to face an interview for his first job in the tech world. Even though not many look for friendship at work but introverts, who in the beginning can be confused for being egoistic for their reserved nature, can turn out to be loyal friends and employees. They can appear too genuine, sometimes unadaptable to situations which are contrary to their belief systems. So, if endless office small talk is your cup of tea then don’t expect an introvert to be in his/ her elements to initiate or even drag such conversations. Introverts are stimulated by deeper conversations of art, philosophy, unique business idea etc. They might be tagged as cold for this approach but still water runs deep, which means that they have more to them than normal eyes can see as they have much sympathy and understanding for intimate friends. This trait of having meaningful interactions helps in developing deep relationships and a close-knit work environment. Thesr are important for introverts. Introverts are generally labeled as shy, recluse or anti-social but often people don’t understand the distinction between shyness and introversion. Shyness is an outcome of fear of social judgement whereas introversion is the response to stimulation, including social stimulation. This means that there can be many shy extroverts who would love to go to pubs or music concerts but might find it difficult dealing with new people whereas there can be many sociable introverts who could be quick to strike a conversation with like-minded people until it is time for them to retire into their den. Warren Buffet enrolled for public speaking classes and later taught night classes even though he knew his business acumen so well was because he did not want to lose on an important potential of associating with people. Self-reflection is the key to growth and career success because mulling over one’s thoughts, emotions and behavior gives the direction to one’s life. All thought leaders, transformative leaders and seekers found solace in the transcendent power of solitude. All these leaders like Gandhi, Nelson Mandela, Prophet Muhammad (PBUH), Moses, Rosa Parks who were otherwise considered quiet and soft – spoken, led people and communities because they often preferred going back to their caves to spend some quiet self-introspection time and seek inner answers and revelations. The reason why I am focusing on the strengths of introverts is because I myself, a certified introvert, went through this process of self-negation during my growing up years, instead of embracing my true self. And I see many individuals who can’t come to terms with the fact that they are more private and always focus more on becoming someone else rather than working on their strengths. Human beings are pattern seeking animals and anything which is different from the general trend is considered abnormal and worst should not be favored and eliminated slowly. As an introvert it can surprise many that I chose teaching and even taught students public speaking, a profession which requires high degree of communication and interaction with people of different age groups and back ground. Something my comfortable self would have directed me to choose a career in writing, fine arts or anything of a solitary pursuit. It turned out that all these strengths helped me a lot as an educator. My listening skills helped me to not only empathize but also to understand students. It also helped me to come up with better and sustainable solutions for students dealing with emotional issues. My reflective nature helped me to analyze the lessons that I could have performed better and steps to make it better by coming up with innovative ideas to be tried in class. Meetings were no more about creating an impression by being loud but that of speaking right and being an observer rather than a participant. These are some of them and I am thankful that I did not force myself to be someone else but accepted myself and worked on the strengths that makes an introvert so unique. So, this brings to a crucial question when introverts have such high reserves of talent, how corporations and society at large can help them to preserve their heritage and help them to shine in their own element. To begin with our educational institutions and teachers need to rethink from designing the classrooms to their approach towards this quiet bunch of people. As an educator I have seen most teachers plan about group tasks and apply group strategies in their lesson plans, but I have hardly seen anyone plan for solo tasks. Even subjects like language arts, creative writing, math problems expect students to sit in groups and become a part of group dynamics. Why would teachers think differently when their own academic coordinators or principal feel that sitting in rows of desks belong to that of dinosaur’s era or students working independently or who prefer their own company instead of playing with other kids are rude, anti-social or even depressed. I have seen teachers sadly suggesting parents that their children should spend more time with other kids and parents readily buy it as they themselves feel perturbed about this behavior. What I want to say that these kids like us are completely normal. They have high intra-personal intelligence which is a good thing as to know others one needs to know thyself. With time they will find more like-minded people and their own breed which will also help them to socialize more. So teachers – next time you want to select someone for debates or any other public speaking contest do cast the net wider to include these nerds who typically won’t be your first choice. Because not only will they give you a better piece of work, written without your supervision but also speak well as an outcome of the process of self-reflection and patience required for reflection. Moving on to workplaces, our workplaces have open spaces with no walls to prevent from constant noise and gaze from other coworkers. They are often not noticed in team meetings or team retreat. The purpose of writing this article is not to drive extroverts out of workplace but how organizations can harness their potential to maintain the perfect yin and yang just like the perfect combination of creativity of Steve Woznaik an introvert with Steve Jobs. So instead of equating everyone across the board, leaders should customize their approach. For example, in a sales team the sales pitch can be given to an extrovert whereas designing the pitch or maintaining long term customer relationship is something that can be assigned to an introvert. Instead of having group meetings to brain storm for every problem, leaders can send teammates to think on their own and huddle together once they have come up with their best ideas thought in solitude. Another advantage of introverts is the level of persistence and concentration that they exemplify which their counterparts might have trouble focusing on. Albert Einstein always said that he was not smart. It is just that he stayed with problems for a longer duration. So, business leaders can give the more complex problem to them to be solved as they will work at it longer before they might feel that it is beyond their scope to simplify. Last but not the least their counter intuitive nature makes them great leaders. In fact, Adam Grant of the Wharton School along with Francesca Gino of Harvard Business School in their ground-breaking research found out that introverted leaders deliver better outcomes than extroverts do when they’re managing proactive employees. We are working in an era of millennials and concepts like military style, top down leadership have become passé. Innovative ideas can be thought by anyone and not every brilliant idea is a CEO’s brainchild. So, the thoughtful introvert with traits like quietness, humility to ask for advice and good listening skills would instill a more democratic and inclusive approach to leadership which improves productivity, promotes a culture of teamwork and empower others to shine by giving them space to demonstrate their knowledge or expertise. At the end Apple did not try to find another Steve Jobs but chose Tim Cook who was way different in terms of his predecessor’s personality and leadership style. However, the unassuming, less commanding and low-key Tim Cook, whom many thought would not be able to do the same justice that Steve Jobs did, bought many significant quiet changes which benefitted the bottom line and boosted their staff morale and improved their brand image. To conclude it is time that we quietly shift away from the popular thought that it is people who exemplify certain alpha characteristics (extroversion, confidence which borders to arrogance) can be better business leaders because the best leaders are those who don’t look for followers but people who can work with them after all ‘Great leaders don’t create followers but create more leaders’.